Navy Blue. Steve Meagher. First Poets Series 15. Guernica Editions. Toronto - Buffalo - Lancaster (U.K.). 2016. "Begging penance for his necessary sin"
George Elliott Clarke mentions Bob Dylan, Jimi Hendrix and Marshall McLuhan when attempting to describe the poetry of Steve Meagher. Not to make this about Today's book of poetry but now is as good a time as any to admit that we here in this office are all members of the George Elliott Clarke fan club - and one time, a long time ago, Today's book of poetry was lucky enough to share a few beers with Sir George of Elliott Clarke at the original Ottawa Royal Oak Inn. Those beers were probably before Mr. Meagher was born. As much as Today's book of poetry admires Mr. Clarke we think he got it a little wrong. If we had to compare Meagher's poetry to anyone it would be the troubadour of tasty trauma Tom Waits. That's if Tom Waits were spending a lot of time with the ghost of Richard Brautigan. Dark wisdom and lyrical splendor from Waits, sweet, tortured and innocent ala Brautigan. Sometimes comparisons don't do anyone justice. Meagher gives us plenty to think about without the comparisons and he does it with panache. Nothing about Navy Blue feels like a first book. Meagher has polished these poems till they shine. Now for some more comparisons. Meagher's poetry universe is full of great characters that you are going to remember. Sweet Baby and Banjo conjure up visions/memories of Sodapop and Ponyboy from S.E. Hinton's most excellent novel The Outsiders. There is a measure sense of menace just under the skin of Navy Blue. Meagher never comes across as rough or vulgar but he keeps a particular tension that captures the reader, keeps the reader on alert. Today's book of poetry was instantly comfortable in Meagher's poetry world. These poems are immediately accessible and that is something we like a lot. 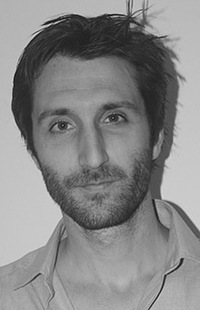 Meagher is generous and playful, even when his poetry is serious as a heart attack. We like that too. Our morning read was as perfect as today's weather here in Ottawa. We opened all the windows in the Today's book of poetry offices and passed Navy Blue around like a new talisman we were learning to believe in. Reading Navy Blue is mining a very rich vein, rich enough that we were able to find another splendid list poem. Regular readers of Today's book of poetry will remember how fond we are of list poems. This one is exemplary, this one came directly from beneath the poets fingernails, the real dirt. Books like Steve Meagher's Navy Blue are exactly why Today's book of poetry is in business. Poetry like this needs to be shared. Poetry this vibrant can make your body hum, it hits a register that your senses can't ignore. We are silly human beans who spend so much time looking for truth we don't always recognize it. Here's a chance. Steve Meagher, well, I'll remember that name. 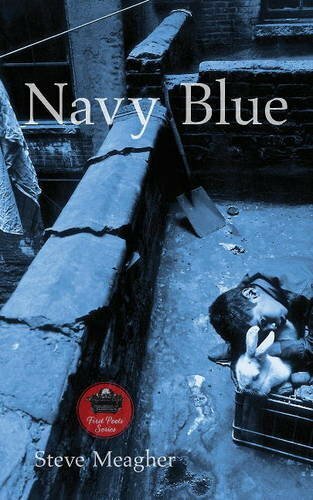 Read Navy Blue and you will remember it too.